... banner of revolution, the army of Ballesteros, which, since the capitulation of his chief [was] still concentrated at Priego, 10 leagues north of Malaga. On this his second Cadiz expedition he[a] was made prisoner by one of General Molitor's corps, surrendered to the apostolical band, and sent to Madrid there to be executed, on the 7th November, four days before Ferdinand's return to the capital. When Ferdinand on his arrival at Madrid was waited upon and congratulated by the officers of the bands of the Foi they having withdrawn, he exclaimed in the midst of his court: "It is the same dogs but with different collars". The number of friars who in 1822 had mustered 16,310, amounted in 1830 to 61,727, being an increase of 45,417[b] in the course of 8 years. From the Madrid Gaceta we see that in the single month from the 24th August to the 24th September 1824, 1,200 persons were shot, hanged, and quartered, and then the barbarous decree against Comuneros, Freemasons, etc., had not yet been divulgated[c]. The University of Sevilla was closed for years, but in its stead a governmental school of bullfighting was established. Frederick the Great seems to have prognosticated the reign of Ferdinand VII. "If the Cortes had sanctioned the bill on the seignorial rights, and thus despoiled the grandees of their properties in favour of the multitude, Your Highness would have encountered numerous, patriotic and formidable armies, which would have organized themselves, as they did in France, under similar circumstances". "The greatest error of the liberals consisted in their not considering that by far the majority of the nation were indifferent or hostile to the new laws. The numerous decrees published by the Cortes with a view to ameliorating the material condition of the people, were unable to produce so immediate results as were required by the circumstances. Neither the abolition of half the tithes, nor the sale of the monastic estates, contributed to ameliorating the material condition of the lower agricultural classes. The last measure, on the contrary, by throwing the land out of the hands of the indulgent monks into those of calculating capitalists, impaired the position of the old farmers by causing higher rents to be imposed upon them, so that the superstition of this numerous class, already wounded by the alienation of sanctified patrimony, became exaggerated by the suggestions of material interests". The revolutionary town population thus estranged from the mass of the nation, were therefore forced, in their struggle with the Grandees, the rural clergy, the monastic power, and the crown which represented all these antiquated elements of society, to depend altogether on the army and its chiefs. The very position thus usurped by the army in the revolutionary camp, together with its isolation from the masses, made it an instrument dangerous for the hands that wielded it, but inoffensive to the enemy it was to strike. Finally, the upper rank of the middle-class, the so-called Moderados, became soon lukewarm and then traitors to the Cause of the Revolution, lulling themselves, as they did, into the hope of getting their reign established by means of a French intervention and thus enjoying the fruits of a new society without painstaking and without admitting the plebeians to participate in them. The positive result of the Revolution of 1820-1823 was not limited to the great fermentation which expanded the minds and renewed the character of some large classes of the nation. The second restoration, in which the antiquated elements of society assumed such shapes as to become insupportable to, and incompatible with the national existence of Spain, was itself a product of the Revolution. Its principal work was to whet the antagonism to such a point as to make all compromises impossible and a war to the knife inevitable. According to Lord Liverpool himself, there never was an extensive political change attended with less violence or bloodshed than the Spanish Revolution during 1820-1823[e]. When we behold, therefore, the civil war of 1833-1843 exterminating the antiquated elements of Spanish society[f], with fire and sword and disgracing itself by acts of cannibalism, we must not attribute the savage inexorableness of that epoch to the peculiar character of the Spanish race, but to the same force of circumstances that imposed upon France the reign of terrorism. While the French centralised and, therefore, abbreviated the reign of terrorism, the Spaniards, true to their traditions, decentralised and, consequently, procrastinated it. Conforming to Spanish tradition, the revolutionary party was not likely to prove victorious by subverting the throne. With them, to be successful, the Revolution itself needed to appear as a competitor for the throne. The struggle of the two societies ought to assume the form of a struggle of opposite dynastic interests. The Spain of the 19th century did her revolution with ease; when she was allowed to give it the form of the civil wars of the XIVth century. It was Ferdinand the Seventh who gave to the Revolution a royal name that of Isabella, while he leagued to the counter-revolution the Don Quixote of the Auto-da-fé, Don Carlos. Ferdinand VII proved true to his character to the [end][g]. If, during his whole life, he had cheated the liberals by false promises, should he not indulge the sport [when ch]eating the serviles on his death-bed? As to religious matters, he had always been a sceptic. He was unable to [con]vince himself that any one even the Holy Ghost should be so silly as to speak the truth. [b] Here the words "professional beggars" are crossed out in the manuscript.—Ed. [c] Examen critique des la révolutions d'Espagne. The decree mentioned by Marx was adopted on October 12, 1824.—Ed. [d] John Bramsen, Remark of the North of Spain, p. 52.—Ed. [e] Lord Liverpool's speech in the House of Lords on February 4, 1823. Hansard's Parliamentary Debates, new series , Vol. 8, London, 1823, pp. 29-34.—Ed. [f] The words "the feudal and monastic power" are crossed out here.—Ed. [g] Here and below the manuscript is damaged. The words in square brackets are restored by the editors.—Ed. 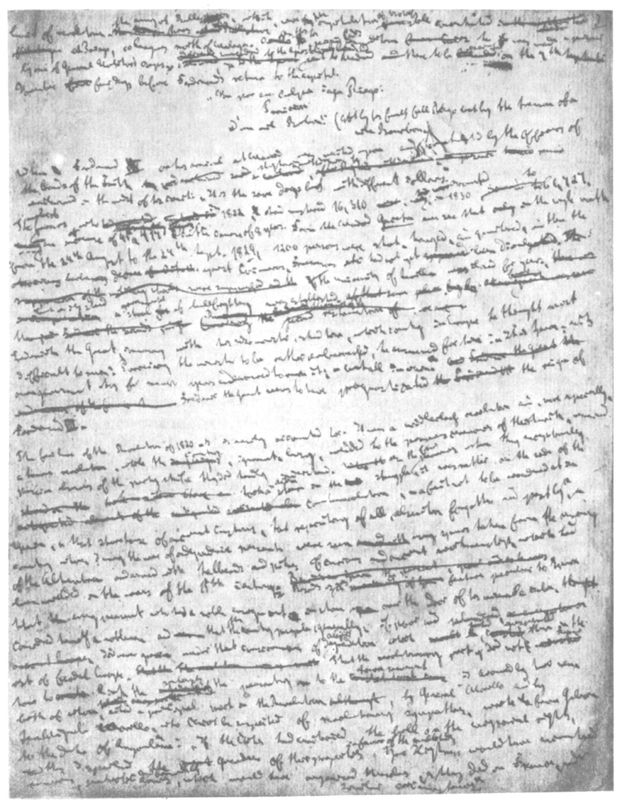 As can be judged from Marx's Notebook, he wrote and mailed to New York three articles more of the Revolutionary Spain series which were entered in the Notebook as "Dienstag. 14. November. Spain 1820-Juli 1822"; "Dienstag. 21. November. Spain. [illegible] Intervention"; "Freitag. 8. December. Spain—1833". None of the articles were printed in the newspaper; their manuscripts have not been discovered. The rough draft published in this volume is apparently part of the article mailed on November 21, 1854. The manuscript contains many deletions only some of which are reproduced in this publication. By the second Cadiz expedition Marx means Riego's campaign in 1823. In August 1823 Riego arrived in Malaga from Cadiz besieged by the French and tried to break through to Catalonia where General Mina was then engaged in fierce fighting with the interventionists. Riego's attempt to gain support from Ballesteros' army, which had ceased resistance, failed, and at the head of a small detachment he marched in the direction of Cartagena. At Jerez his detachment was defeated; on September 15, Riego was captured. The first Cadiz expedition was Riego's campaign of 1820, which was the starting point of the revolution (see this volume, pp. 442-43). Reference to the army of faith—the name of detachments formed by the Catholic absolutist group. In 1822 these detachments staged a mutiny against the revolutionary government in Catalonia, Navarre and Biscay; in 1823 they fought on the side of the French interventionists. Comuneros—members of a secret political association, the Confederation of the Spanish comuneros, founded during the 1820-23 bourgeois revolution. The comuneros voiced the interests of the most democratic sections of the urban population: artisans, workers, sections of intellectuals and officers and the petty bourgeoisie. They numbered seventy thousand and most resolutely opposed the counter-revolution. After the suppression of the revolution the comuneros were severely persecuted and ceased their activities. The reference is to the restoration in Spain of the absolutist regime of Ferdinand VII as a result of suppression of the 1820-23 revolution. The first restoration of Ferdinand - VII was in 1814, after Napoleon's defeat. The reference is to the Carlist war of 1833-40 and the bourgeois revolution in Spain (1834-43). See also notes 224↓, 227↓. In September 1832, Ferdinand VII, then gravely ill, annulled his decree of 1830, by which his daughter Isabella, an infant at the time, was made heiress to the throne; when he recovered Ferdinand reinstated her, thus disappointing the hopes of the serviles (see Note 323↓) who supported his brother Don Carlos. Serviles—the name given to a reactionary clerico-absolutist group during the first bourgeois revolution in Spain (1808-14); later the serviles formed the Court camarilla of Ferdinand VII, and during the last years of his life pinned their hopes on his brother Don Carlos. Liberales, who expressed the interests of the bourgeoisie and liberal nobility, put forward as their programme the 1812 Constitution. Americanos—the name given to small group in the Cortes representing the Spaniards living in the Spanish colonies in Latin America. They played no significant role. The Council of Trent was a - general council held by the Catholic Church in Tridentum (Trient) and Bologna from 1545 to 1563. It condemned Protestantism and adopted a number of decisions concerning the Catholic Church; in particular, it proclaimed the Pope's authority over the councils and strengthened the power of bishops. The main result of the Council of Trent was the persecution of heretics and free-thinkers, and intensification of Church censorship. From 1559 the Index librorum prohibitorum was published regularly and in 1571 the Congregation of the Index (an office in Vatican dealing with censorship) was set up; it remained till 1917. The decree of March 6, 1820 and the decrees mentioned by Marx below were published in Miraflores, Essais historiques et critiques pour servir à l'histoire d'Espagne, de 1820 h 1823, t. I, Paris, 1836, pp. 257, 261-62. It is probable that Marx's main source in describing these events were: Henry Davis, The War of Ormuzd and Ahriman in the Nineteenth Century, Baltimore, 1852; La España. Bajo el Poder Arbitrario de la congregacion Apostólica o Apuntes Documentados para la Historia de este Pais desde 1820 a 1832. Second edition, Paris, 1833 and M. de Chateaubriand, Congrès de Vérone. Guerre d'Espagne. Negociations. Colonies espagnoles, Brussels, 1838, t. 1, excerpts from which he made in October 1854.